Keep out of reach of children. Eye irritant. May be harmful if swallowed. Do not get in eyes. May be severely irritating to eyes. Do not ingest. Avoid contact with skin. Contains surfactants. First Aid: If in eyes, immediately rinse with plenty of water. Remove any contact lenses and continue rinsing eyes for at least 15 minutes. If irritation persists get medical attention. If swallowed, rinse mouth and drink a glass of water. Do not induce vomiting. Call a physician or Poison Control Center. For Best Results: Medium load washes: Fill between lines 2 and 3. Machine Wash: Select appropriate washing cycle. Follow the garment label instructions for water temperature. For Top-Loaders: Fill machine with water. Pour Woolite into water. Add garments. 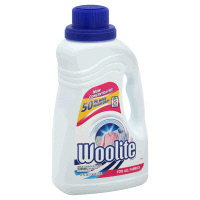 For Front-Loaders: Pour Woolite into dispenser/drawer. Nabisco Ritz Fresh Stacks Crackers. Domino Pure Cane Sugar Superfine Quick Dissolve.Easy pour! Growing up strong with big G kid cereals. 75% of kids don't get the recommended levels of calcium and vitamin D. At General Mils, we are committed to giving kids nutrients that will help them grow up strong! Calcium: calcium is critical to helping kids' bones and teeth grow strong. In fact, most bone growth occurs during childhood, so a calcium-rich diet is essential! Every serving of this cereal is a good source of calcium kids need. Vitamin D: all big G kid cereals are a good source of vitamin D, which helps kids absorb calcium to build and maintain strong bones. Mug Diet Root Beer.0 calories per can.No caffeine.12 pack. 10 vitamins & minerals. Good source of calcium. Exchange (per serving): 3 carbohydrates, 1 1/2 fat. The dietary exchanges are based on the Exchange Lists for Meal Planning, copyright 2003, by the American Diabetes Association, Inc. and the American Dietetic Association. Cap'n Crunch's Crunch Berries combines crunchy sweetened corn and oat biscuits with delicious fruit flavored berry shapes. Diet Coke - 24 PK.The Heart Truth.mycokerewards.com.Join diet coke in support of women's heart health programs.Visit www.dietcoke.com.0 calories.0g sat fat 0g, 0% DV.Sodium 40mg, 2% DV.Sugars 0g.Per 1 can serving.24-12 fl oz cans (288 fl oz).